My 85 300D has had a loping idle since I purchased it in October. Not bad of a lope when started, but rocks badly after a 10 minute freeway run. Last week I actually lost power while trying to accelerate from 55 to 65. The fact that it went from a lope to a fuel starvation issue was key as this finally gave me an excuse to purge the tank. This car has been a Florida car most of its life; has 158,000 miles and is rust free. Check out the tank screen. Gonna pick up a new one in the pm. Also will be resealing the lift pump. Will give a results report later this week when all back together. Ended up removing the tank for a power washing and shopvac/mityvac drying out; looks good as new. Someone else from Tampa with a w123!!! Those will clean up nicely if you want to reuse. Just make sure that nothing is torn after you get it cleaned up. If you order a new one, make sure you get the right strainer for your application. Some vendors list a single part number for both gas and diesel. 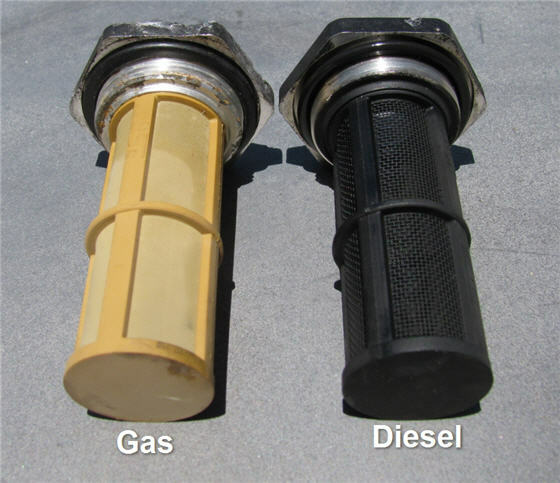 You wouldn't want to be running a gas mesh in a diesel, particularly with the results you just experienced. I just pulled and cleaned my tank. I thought my filter was nasty but man you win the prize. After I pulled my tank I poured 2 gallons of Cider Vinegar in sloshed it around a couple of three times every couple of hours then let it sit overnight. Poured out the Vinegar and let it dry hanging from a tree filler neck down. Poured about a half pint of Denatured Alcohol in sloshed it around coating the inside, replaced the hoses and bang I'm back in business. Tanks full no leaks, be careful with the fuel sender. I'm happy. I was able to clean the filter to a very acceptable level. The issue is that the dealer here in town does not have the gasket in stock, but NAPA has the filter and gasket. So basically to save a few days, i'll just change them both. No way I want to risk not changing the gasket just to have to drain fuel again... Will likely add a gasket to my next parts order to keep as a spare. I had a similar problem with my E300D and after cleaning - its "WOW this engine can pull" I was using startron for a dozen of a dozen tankfulls (gros) and all the ick was nicely placed in the upside down bowl in the tank. Some folks would not agree, but I like to just cut off the strainer part so whatever is in the tank will get caught by the primary filter. It is much easier to replace a primary filter than to drain the tank! I want to get whatever is in (or gets in) out of the tank, and not have to drain the tank more than once. I guess I am one who disagrees. You are presuming that nothing is going to get stuck in the Tubing and Hoses between the Primary Filter and the Fuel Tank. Of course that won't happen if your Fuel tank has no Rust that continues to flake off or you don't get a load of contaminated Fuel from some station. Sorry I disagree also for the reasons mentioned above. Just too many chances of a large contaminate particle getting stuck in the tubing between the tank and the in-line filter. I too have no tank screen in my '79. When I bought it, the PO informed me that it had been removed by the original dealer in 1990 to alleviate a bio-contamination problem, so the car has been without it for over 20 years at this point. In addition, the car is equipped with a dealer installed 14.9 gallon second tank which is connected to the main fuel line through a simple tee, and it has no screen. So essentially there has been no tank screen in the car since it was new. When I began using biodiesel a few years ago, I went through a period of frequent filter changes, and some pretty impressively clogged primaries, but never a clogged line. Now my tanks are completely free of gunk. While there is some risk in running without the screen, it is not a great risk. 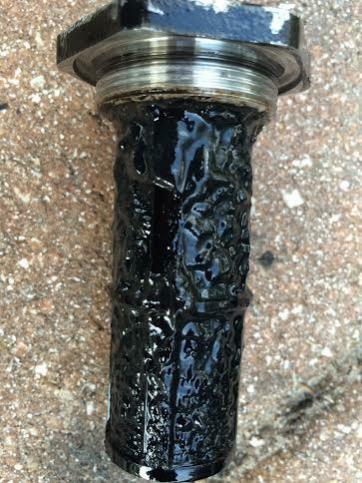 In my view, a fuel line blockage is no more work to remedy than that required to clear a plugged screen.